The DTM-3200 converts IP to ASI, or ASI to IP. Integrate this compact module to extend the range of I/O standards supported by your product. Technical highlights include advanced IP-jitter filtering, ultra-low latency and zero-jitter IP transmission. Standalone OEM module for conversion between IP and ASI. Development kit, consisting of DTM-3200, power supply, USB interface converter, USB cable and MCX-to-BNC cable assembly for ASI port. The DTM-3200 can be controlled through one of the available serial interfaces. Settings applied are stored in nonvolatile memory on the unit, and automatically reloaded after a power cycle. It is not possible to configure the device via the Ethernet interface. Dtm3200Util - Windows tool to view status, to control settings and to upload firmware. This tool is convenient for initial configuration and for experimentation with the DTM-3200. DtmHandler - A set of C functions, also useable from C++, implementing a protocol handler. With these functions, controlling the DTM-3200 from your application becomes really easy. Full source code is available, so that you can use the protocol handler functions with any compiler. DtmCmd - Windows/Linux command line tool for controlling the DTM-3200. DtmCmd is an example of using the DtmHandler functions. This product can be considered a "DTM-3200 in a box" for IP to ASI conversion. The unit is a finished stand-alone product that can be directly mounted on a DIN rail or in a 19" inch rack. As there is no host for serial control, a convenient web GUI and SNMP agent are provided. Similar to the DTE-3100, but this model is for ASI to IP conversion. 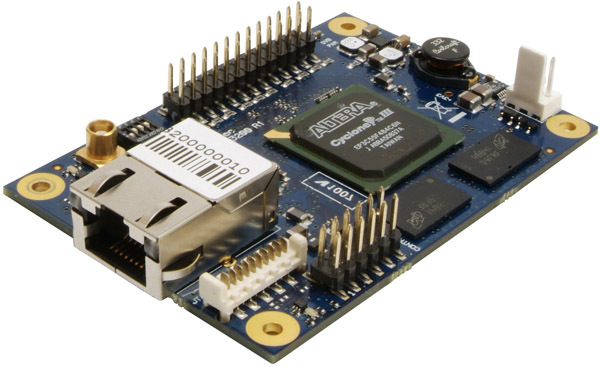 Not a standalone product, but a PCI Express adapter with a single 1GbE- and three ASI ports. Use this card if you want to process the transport stream on the PC server.